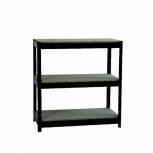 Storage Solutions Heavy Duty Boltless 3-Shelf Unit Black ZZHT3BK094A09545 Pack of 1 Storage Solutions heavy duty boltless frame unit with 3 adjustable shelves. Steel framework complete with wooden shelves that accept up to 150kg in weight. Can be used as a workbench. Dimensions: W950 x D450 x H940mm. Colour: Black. Non returnable. Avior 1800mm Bookcase Box A Sides And Back Panel Cherry KF72304 Pack of 1 Box A for an Avior Ash 1800mm Bookcase. Contains the back and side panels. For full bookcase, combine with Box B. Easy to assemble. Size: 1800mm. Finish: Cherry. Non returnable. Avior 1800mm Bookcase Box B Top, Bottom, All Shelves And Fittings Cherry KF72305 Pack of 1 Box B for an Avior Ash 1800mm Bookcase. Contains the top and bottom panels as well as the shelves and fittings. For full bookcase, combine with Box A. Easy to assemble. Size: 1800mm. Finish: Cherry. Non returnable. Avior 1800mm Bookcase Box A Sides And Back Panel Ash KF72306 Pack of 1 Box A for an Avior Ash 1800mm Bookcase. Contains the back and side panels. For full bookcase, combine with Box B. Easy to assemble. Size: 1800mm. Finish: Ash. Non returnable. Avior 1800mm Bookcase Box B Top, Bottom, All Shelves And Fittings Ash KF72307 Pack of 1 Box B for an Avior Ash 1800mm Bookcase. Contains the top and bottom panels as well as the shelves and fittings. For full bookcase, combine with Box A. Easy to assemble. Size: 1800mm. Finish: Ash. Non returnable. Avior 1600mm Bookcase Box A Sides And Back Panel Cherry KF72308 Pack of 1 Box A for Avior 1600mm bookcase. Contains back and side panels. Assemble with Box B (KF72311) for complete bookcase. Ideal for office file storage. Width: 1600mm. Finish: Cherry. Non returnable. Avior 1600mm Bookcase Box B Top, Bottom, All Shelves And Fittings Cherry KF72309 Pack of 1 Box B for Avior 1600mm bookcase. Contains top, bottom, shelves and fittings. Assemble with Box A (KF72309) for complete bookcase. Ideal for office file storage. Width: 1600mm. Finish: Cherry. Non returnable. Avior 1600mm Bookcase Box A Sides And Back Panel Ash KF72310 Pack of 1 Box A for Avior 1600mm bookcase. Contains back and side panels. Assemble with Box B (KF72311) for complete bookcase. Ideal for office file storage. Size: 1600mm. Finish: Ash. Non returnable. Avior 1600mm Bookcase Box B Top, Bottom, All Shelves And Fittings Ash KF72311 Pack of 1 Box B for Avior 1600mm bookcase. Contains top, bottom, shelves and fittings. Assemble with Box A (KF72310) for complete bookcase. Ideal for office file storage. Width: 1600mm. Finish: Ash. Non returnable. Jemini 700mm Open Storage Box A Beech KF73681 Pack of 1 Jemini Open Storage Box A Beech KF73681. Adaptable storage accommodating both A4 and Foolscap Files. Size: 700mm. Non returnable. Jemini Open Storage Top/Bottom Beech KF73682 Pack of 1 Jemini Open Storage Top/Bottom Beech KF73682. Adaptable storage accommodating both A4 and Foolscap Files. Non returnable. Jemini Intro Desk High Bookcase 800mm Doors Oak KF74134 Pack of 1 Pair of doors for Jemini Intro Bookcase. Designed for the 800mm bookcase. Simple installation. Height: 800mm. Finish: oak..
Jemini Intro Desk High Bookcase 800mm Doors Maple KF74135 Pack of 1 Pair of doors for Jemini Intro Bookcase. Designed for the 800mm bookcase. Simple installation. Height: 800mm. Finish: maple..
Jemini 1000mm Open Storage Box A Beech KF73684 Pack of 1 Jemini 1000mm Open Storage Box A Beech KF73684. Adaptable storage accommodating both A4 and Foolscap Files. Non returnable. Jemini 1800mm Open Storage Box A Beech KF73687 Pack of 1 Jemini 1800mm Open Storage Box A Beech KF73687. Adaptable storage accommodating both A4 and Foolscap Files. Non returnable. Jemini 2000mm Open Storage Box A Beech KF73688 Pack of 1 Jemini 2000mm Open Storage Box A Beech KF73688. Adaptable storage accommodating both A4 and Foolscap Files. Non returnable. Jemini 700mm Open Storage Box A Oak KF73697 Pack of 1 Jemini 700mm Open Storage Box A Oak KF73697. Adaptable storage accommodating both A4 and Foolscap Files. Non returnable. Jemini Open Storage Top/Bottom Oak KF73698 Pack of 1 Jemini Open Storage Top/Bottom Oak KF73698. Adaptable storage accommodating both A4 and Foolscap Files. Non returnable. Jemini Open Storage Shelf Oak KF73699 Pack of 1 Jemini Open Storage Shelf Oak KF73699. Adaptable storage accommodating both A4 and Foolscap Files. Non returnable. Jemini 1000mm Open Storage Box A Oak KF73700 Pack of 1 Jemini 1000mm Open Storage Box A Oak KF73700. Adaptable storage accommodating both A4 and Foolscap Files. Non returnable.